In the 150 years since its humble birth, baseball has shown an infinite capacity for exhilarating triumphs, heart-breaking losses, amusing blunders, and awe-inspiring feats. Willie Mays's amazing catch of Vic Wertz's monstrous drive in the 1954 World Series, Bobby Thomson's "shot heard round the world," the "Black Sox" Scandal of 1919, DiMaggio's 56-game hitting streak, even the pitiful 1962 Mets, who finished 60 games (or two full months) out of first place--these are all part of baseball lore and part of its allure. A banquet for baseball fans, Baseball Anecdotes offers a colorful and highly entertaining anecdotal history of America's National Pastime, from the founding of the first professional baseball team, Cincinnati's Red Stockings, by George Wright (the son of a famous English cricketer) and the forming of the first league (in a New York bar on St. Patrick's Day), to the miraculous comeback of the Mets in the Sixth Game of the 1986 World Series. Here you will meet the game's great innovators (from John Montgomery Ward, who invented the pitching mound--and also pitched the second perfect game in history--to Bill Veeck, who introduced the exploding scoreboard in Comiskey Park); the colorful eccentrics (such as King Kelly, who was accompanied off the field by a black monkey and a Japanese valet) and the self-effacing stars (such as Harmon Killebrew, who, when asked what his hobbies were, said, "Well, I like to wash dishes"); the penny-pinching owners (when Babe Ruth requested tickets for the Yankee's 1936 season opener at The House That Ruth Built, the team management said sure, just send in a check); and, most of all, the legendary players: Ruth, Ty Cobb, Rogers Hornsby, Lefty Gomez, Sandy Koufax, Casey Stengel, Mickey Mantle, and countless others. Along the way, readers are treated to instant replays of some of baseball's most memorable moments, such as Roger Maris' quest for Ruth's 61-home-run record, Don Larsen's perfect World Series game, and Ted Williams' final major league at bat (he hit a home run). 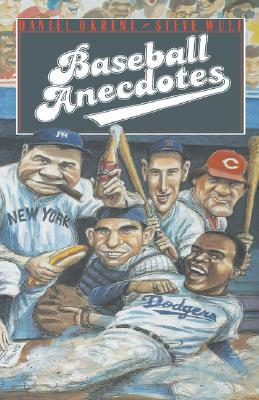 Okrent and Wulf, two highly regarded baseball writers, touch all the bases in this vividly written volume, capturing the whole human drama of baseball in a cascade of stories that offers a nostalgic feast (or, as Yogi Berra would put it, "Deja vu all over again") as well as a fascinating introduction to baseball lore for the newest generation of fans.